We are introducing a series of Chaplain's specific Training programmes to compliment the Degree Training programme currently offered. Under the umbrella of Tell Them Outreach Church, which covers Tell Them Outreach Fellowship Network to which RCBI and Third Millennium Covenanters are affiliated, we shall now also run the International Chaplain's Federation also as an Affiliate. This not only allows us to train Chaplains for work with Police Departments, Fire Departments, Prisons and Emergency Services etc, it means that we can now also License and Ordain them to. We shall not only offer Chaplains training but shall also offer them where possible, spiritual and practical help also. 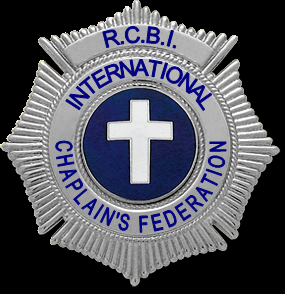 Unless you are already Licensed or Ordained, you must start your training via the RCBI Core Module 1.
or click on International Chaplain's Federation above to take you to the link group.